The revision in IT budgets at the end of 2010 led to a 2.5 per cent decline in the market for printers, copiers and multi-function devices in India to 6.65 lakh units in the first quarter of 2011 compared to the same quarter last year, according to Gartner, Inc.
"The revision led to controlled purchasing of print devices and IT hardware spending. However, the future outlook is positive. Purchasing will beef up in the coming months as economic activities will resume momentum," said Amrita Choudhury, research analyst, Gartner. Samsung Electronics sales dived with a 42 per cent drop in shipments that shrunk its market share from 10.8 per cent in the first quarter of 2010 to 6.4 percent in the same quarter this year. Epson was the main gainer with its shipments rising 37.8 per cent and in the process it overtook Samsung as the third largest player for the first quarter of 2011. In the market for A4 multi-function devices, HP had 65.7 percent market share, while by Canon with 15.7 percent, Samsung with 6.1 percent and Epson with 5.2 percent market share in the first quarter of 2011. In the A3 flatbed copier and multi-function devices segment, Canon led the market with 24.6 percent market share, followed by Toshiba with 21.9 percent, Ricoh with 12.5 percent, and Sharp with 11.9 percent market share. The page printer market declined 14.1 percent in the first quarter of 2011. HP continued to dominate the segment with 48.3 percent market share, a 6.6 percent increase from the first quarter of 2010. Canon's market share totaled 36 percent, a 13.6 percent decline. 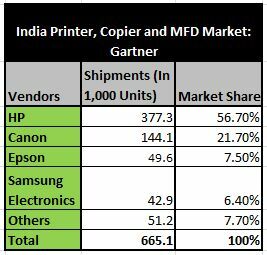 Samsung recorded a decline of 52 percent, but it accounted for 11 percent market share in the Indian page printer market.